Nokia has officially launched its flagship phablet that has been named 1520. Already much hype has been garnered by this device thanks to its awesome features and a super amazing camera. The device will take charge from the Lumia 1020 in terms of being the flagship and has the same polycarbonate body design. Built: The dimensions of this device are 162.8 x 85.4 x 8.7mm and it weighs about 209 grams. Its big and it weighs over 200 grams and has a pretty sturdy build quality. Display: The Nokia Lumia1520 will sport a capacitive full HD LCD ClearBack AMOLED touch display of 6 inches with a resolution of 1080 pixels. It has a pixel density of 368 ppi. It features Sunlight readability, High Brightness Mode, Gorilla Glass 2 protective screen and super sensitive touch for nail and glove usage. Processor: This device has been powered by a Qualcomm snapdragon 800 quad core processor clocked at 2.2 Giga Hertz which is at par with its Android counterparts. There’s nothing better available for the time being so Nokia is right up there in terms off equipping the device with a great processor. 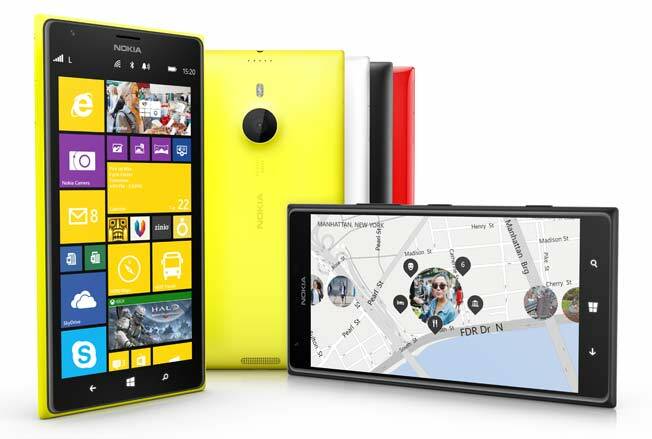 Operating System: The Nokia Lumia 1520 will run on Windows Phone 8 platform. Nokia and Microsoft are constantly working to expand it so it will be one of the juggernauts in future. Memory: It will feature a RAM of 2 GB and an internal storage capacity of 32 GB. It also offers SkyDrive Cloud storage of 7 GB. Lumia 1520 also provides expandable memory of up to 64 GB by using a micro SD card. Can it get any better? I don’t think so. Camera: This device has been equipped with a PureView primary camera of 20 mega pixels with ZEISS optics, OIS, dual LED flash, Auto focus and other amazing features that enable you to take beautiful pictures. It also carries a front facing camera of 1.2 mega pixels. It is better than any of the competition and uses oversampling to ensure you get a picture with almost no noise and lossless zoom. Connectivity Features: The connectivity features incorporated in this device include micro USB, 4G, 3G, A-GPS + GLONASS, NFC, Wi-Fi and Bluetooth 4.0. So you are all sorted in this regard. Other Features: Lumia 1520 also offers proximity sensor, accelerometer, gyroscope, magnetometer and ambient light sensor. Battery: This device works on a powerful non removable battery of 3400 mAh. This is actually quite a powerful battery and Nokia has ensured that you get through more than a day with a single charge. Our Take: The Nokia Lumia 1520 comes with some great features, the primary highlight being its camera and processor. Nokia could not have equipped it better and will be priced around Rs 45,000 when it comes to us later this year. If Nokia manages to price it around the Rs 40,000 mark, we might just have a winner on our hands. This device is surely going to receive huge positive feedback from users. It is surely going to be a tough competitor in the market. no seperate volume control for ringtone and music player.. if u decrease volume in music ur ringtone volume also goes down..
htc one dual sim is also 44,000 only..
nokia buyers are just fools like me… iam deeply dissapointed with nokia..
Dont blame nokia for that nokia is a harware manufacturer,all the issues you have mentioned are software issues related to windows phone and microsoft should be held responsible for it nokia is an excellent harware manufacturer and has been creating quality devices ever since the company started,its sad to see how because of a few issues of windows phone made by microsoft nokias image is being damaged.